I worked at the beautiful Palace Theatre in the mid to late 1990s as part of the Stage Management team, when it was under the wonderful leadership of Chris Dunham. We produced some amazing productions in what was one of the last few true rep companies. 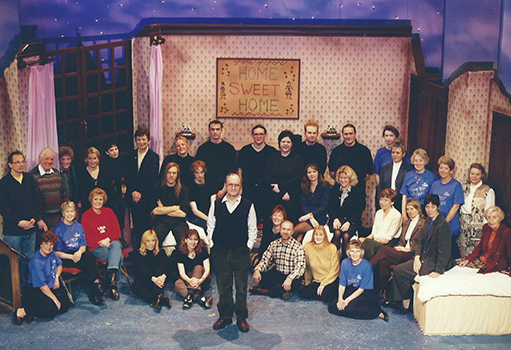 I have attached a full company picture taken on the set of Peter Pan [December 1998]. I’m eighth from the left, beneath the bottom left corner of the sign. 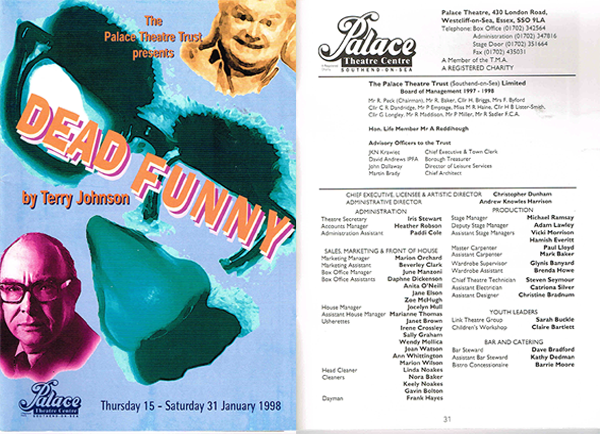 That was a sad occasion, as it had been announced that the theatre would be closing in March 1999. Even so, I have very happy memories of an extraordinary theatre and a great team behind it. I’m now [November 2015] one of the Stage Managers of the Royal Opera House in Covent Garden. I’ll always be indebted to the Palace Theatre and Chris Dunham for giving me my first professional job. Thank you. David Simpson, archivist, adds: Many thanks, Adam, for such a lovely contribution. Provincial rep saw the beginning of many careers in the theatre, and it’s always nice to hear from people who got their start at the Palace. This page was added by Jo Bund on 04/01/2016.